It is often thought in sport, business and life that we always have to work on our weaknesses... But is this the best way? 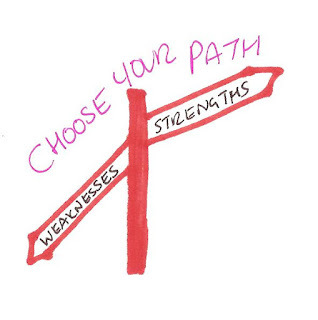 By working on our strengths we can automatically bring along those areas where we are not so strong. Worrying always about our perceived weaknesses can take a lot of time, energy and emotion which could be better spent on building confidence by feeling good about what we do well. In order to be successful it is important to focus on our strengths not try to eliminate our weaknesses. We all have people around us who have an opinion on what's best for us and we need to remember we are the only ones being us and all that means for our life, training and sport. In order to achieve we need to be feeling confident and strong in what we are doing, which isn't going to happen if we only focus on weaknesses! We also need to remember that it's easy to get quick improvements when you start off and are going from OK to good, but what makes the difference is being able to sustain or improve when you're at the top - that's where the thinking, planning and work comes into it. That's where we have the EDGE. So what are you good at and how can you keep or improve on it, that's where our energy should be! "I also focus on my strengths. I don't devote any more than 10% of my energy to working on my weaknesses. I'll never be perfect, and I don't have to be. My strengths are my strengths for a reason and focusing on them allows me to work on weaknesses from a place of confidence rather than need. Confidence is worth more than anything else."